I am a 37-year-old woman and I am not immune to the current unicorn craze. In fact, I squealed with delight as I added the final sprinkles to these gorgeous and delicious unicorn bars! As much as I love all things unicorn, I’m not going to be rocking unicorn hair or unicorn eyeshadow anytime soon. I have my limits, y’all. I’ll stick with expressing my unicorn love through baking. 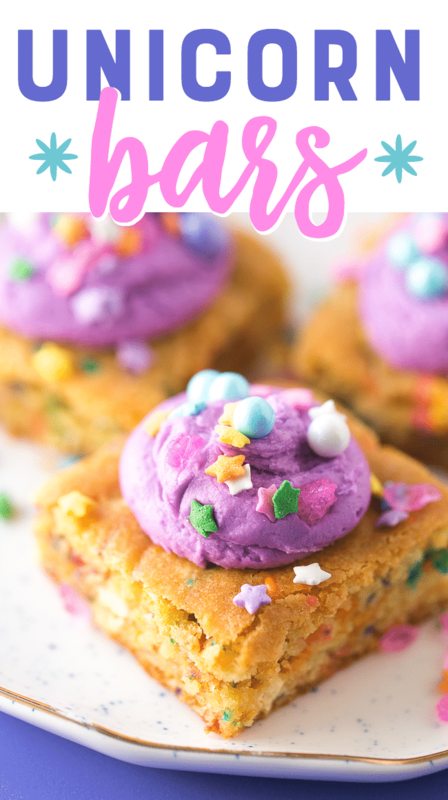 These pretty unicorn bars are so easy to make and they taste amazing. 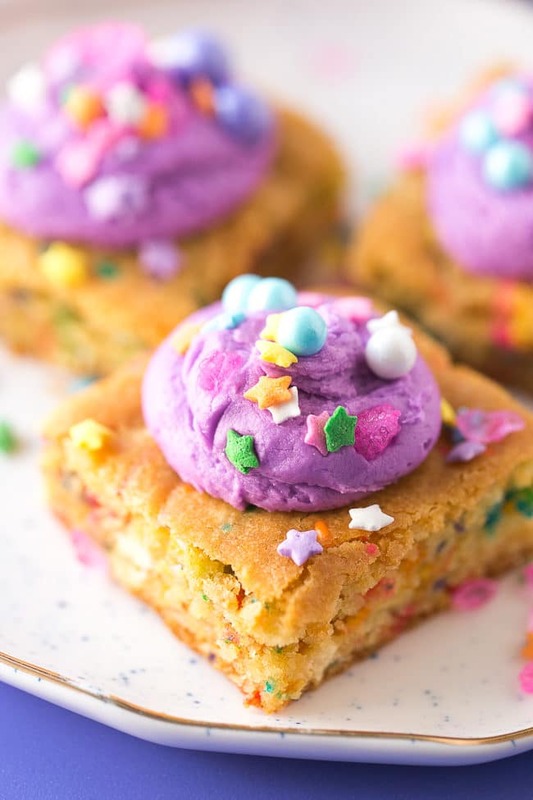 In fact, these unicorn bars would be just fabulous for a little girl’s birthday party. The base of this recipe is my good old cake mix cookie bars recipe that I’ve used a million times. 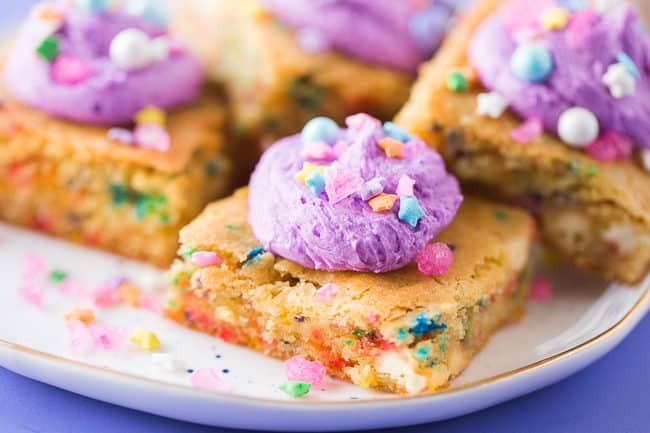 It works really well with sprinkles and white chocolate chips mixed into the batter, but, you can really add any mix-ins you like. I used a variety of sprinkles and chocolate pearls that I had on hand, but I’ve been meaning to buy some of these insanely gorgeous sprinkles from Sweetapolita. Why have I not bought some of these yet? SO CUTE. Of course, my unicorn bars might not look like the unicorn bars that you have in your mind. That’s okay, because you can make the frosting any color you like and you can use any type of sprinkles you prefer. You could even go completely unicorn crazy and make a white chocolate unicorn horn like the one I made in this unicorn yogurt bowl post. 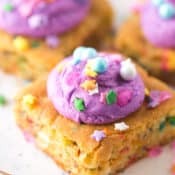 Be sure to take a picture and tag me @dearcrissy on Instagram if you decide to whip up a magical batch of these yummy unicorn bars! 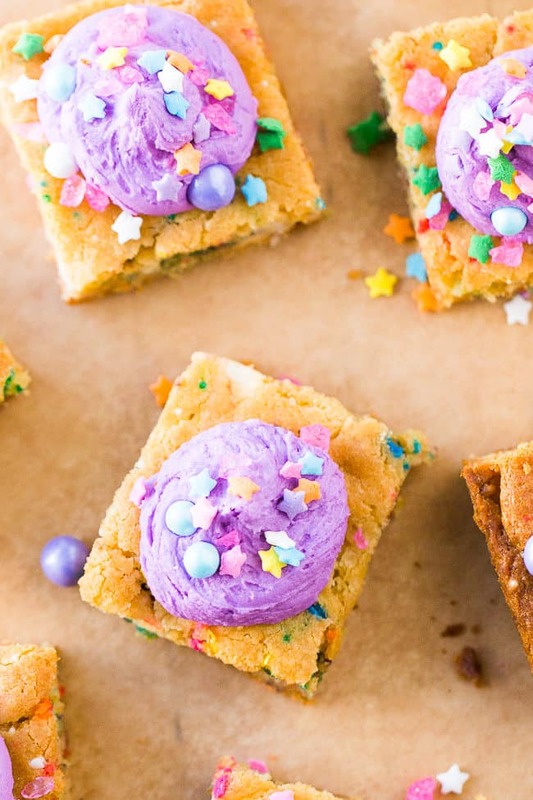 Add several drops of gel food coloring to frosting and stir. I used neon pink and purple to achieve this color.